Dengke Chen is currently Assistant Professor of Digital Arts, Department of Creative Arts, Stetson University, Florida. He received his Master of Fine Arts in New Media from Pennsylvania State University and his Bachelor of Arts in Animation from China Central Academy of Fine Arts. His practice concentrates on new media art, 3D animation, computer games, illustration and comic art, traditional animation, and 3D motion graphics. Unlike the single narrative storytelling techniques used in traditional animations to amuse and entertain audiences, Chen's animations have nonlinear narratives that engage viewers to critically reflect on social and ethical issues. Through animation based on art practice, by projecting his thoughts and personal experience on distorted stories, Chen propose new insights and compels audiences to think about the unvarnished beauty and ugliness of the world. By bringing awareness of social problems and ethical issues, Chen uses his art to help his audience envision a world where every sentient being can live in harmony. In a welcome piece of good news for the world’s threatened wildlife, the giant panda has been downgraded from ‘Endangered’ to ‘Vulnerable’ on the global list of species at risk of extinction, demonstrating how an integrated approach can help save our planet’s vanishing biodiversity. While the panda’s status has improved, climate change is still driving these animals toward extinction. Giant pandas are native to mountain ranges in China, and as such, they’ve adapted to live in cool temperatures. As climate change warms their native homes, panda populations must move higher up in the mountains to find areas that are acceptable temperatures. Combined with the fact that bamboo forests are slow-growing and not likely to migrate, pandas may need to choose between being hot or being hungry. Due to increased infrastructure building in vital areas used for food and migration by pandas, panda habitat has become smaller and more fragmented. Despite a lot of good work from China in creating new panda conservation areas, tourism and development were putting increasing pressure on the species. In a longer term, if emissions continue to rise unchecked, like many other extinct species, giant pandas might only be examined in the museum. 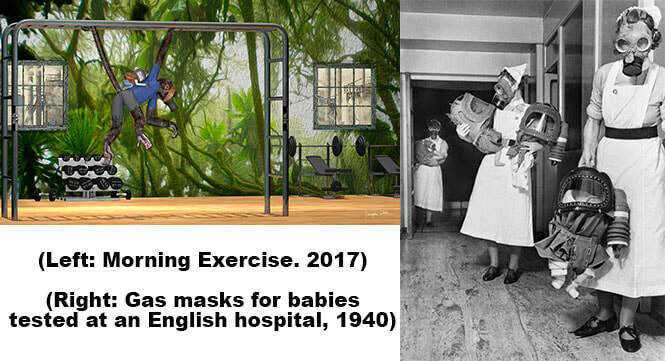 In 1938, the British Government gave everyone, including babies, gas masks to protect them in case the Germans dropped poison gas bombs on Britain. They were carried normally in a cardboard box or in some cases a tin box and had to be taken wherever they went. Children were issued with colored masks to make them feel less scary. In London hospital, babies were cocooned in baby gas respirators with carrying handle on the respirator used to carry the baby by the nurse. The design covered the whole of the baby except for its legs. However, war is not the only case that triggered the invention of gas masks. Air pollution was, of course, nothing new. the Great Killer Smog of 1952 was responsible for 3,000 to 12,000 premature deaths in London. Over Thanksgiving weekend in 1966, the layer of smog that hung above New York City killed about 200 people. An estimated 300–405 people died during a two-week smog episode in 1963. In 1953, as many as 260 died from breathing the city’s air over a six-day stretch. In present, dense smog is occurred in many cities in China, causing respiratory diseases and death. Are we leading ourselves to an era that every living creature has to wear gas masks and adapting to the post-civilization life? Temperatures in many regions of the world are changing due to high concentrations of greenhouse gases that warm the Earth’s atmosphere. With warmer winter in the Arctic, ice that is melted in the summer does not refreeze. Sea ice also melts at a cooler temperature than freshwater. Due to the global warming the glaciers calving and retreating dozens to hundreds of meters every year, and the pack ice is disappearing in record speed. Bearded seals make their homes in sea ice. Without the sea ice, there are no seals, which means that the polar bear’s meals have migrated. The bears are forced inward on land which creates more difficulty hunting for food and difficulties in reproduction. There are fewer square miles of ice in the Arctic, there is less food, which puts the bears at risk of becoming endangered. In a longer term, if emissions continue to rise unchecked, the risks are profound and might precipitate the sixth mass extinction of plants and animals in the Earth’s history. The transcontinental railroads in the USA helped open up unpopulated interior regions of continents to exploration and settlement that would not otherwise have been feasible, but the merit might be different from the native residents' point of view. America’s westward expansion turned the frontier wilderness of the western territories into regions populated by European-Americans, and effectively ending the traditional Native American way of life. The construction of the Transcontinental Railroad had dire consequences for the American Indian's tribes, forever altering the landscape and causing the disappearance of once-reliable wild game. 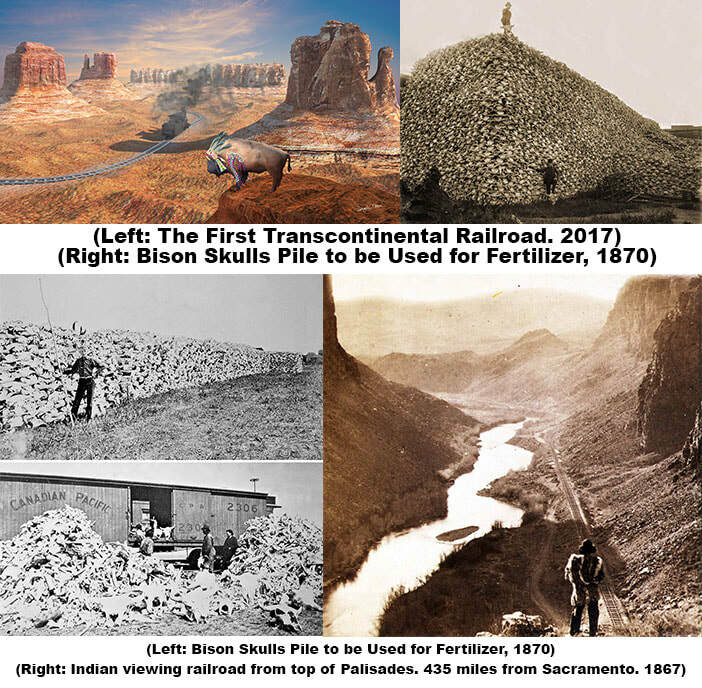 The railroad was probably the single biggest contributor to the loss of the bison, which was particularly traumatic to the native tribes who depended on it for everything from meat for food to skins and fur for clothing, and more. At that time, the railroad industry wanted bison herds culled or eliminated. Herds of bison on tracks could damage locomotives when the trains failed to stop in time. Herds often took shelter in the artificial cuts formed by the grade of the track winding through hills and mountains in harsh winter conditions. As a result, bison herds could delay a train for days, or potentially wrecking the engine. The railroads would hire marksmen to ride their trains and just shoot the bison as the train went by. When modern Europeans arrived in North America, an estimated 50 million bison inhabited the continent. After the great slaughter of American bison during the 1800s, the number of bison remaining alive in North America declined to as low as 541.